With Glittering Eyes: We were Scarecrows. 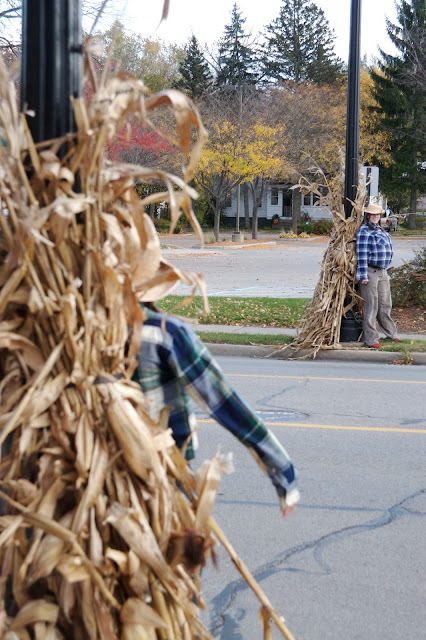 Every year in Lowell, Main Street is lined with scarecrows to celebrate the harvest season. And every year in Lowell, I loathe them. Seriously, since I was in high school I have always thought they were awful. They made me feel like scary people were about to walk right out in the street in front of me as I drove. Some things, though, must be accepted, and I suppose the Lowell scarecrows are one of them. 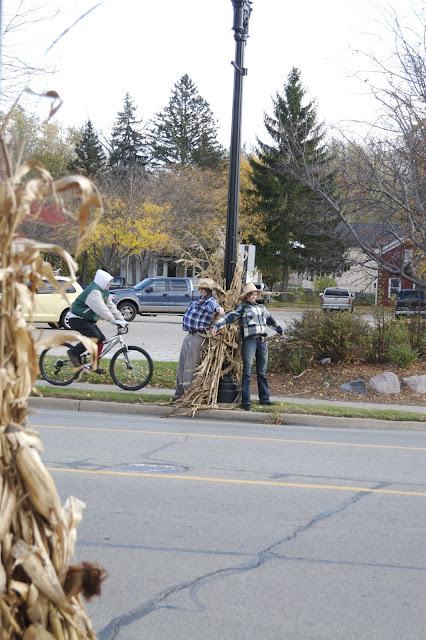 Fortunately for us, there were two adjacent, scarecrow-free light poles outside of my parents business, so we planted ourselves right outside of their storefront. At first, no one was really noticing us. So we decided to make slight movements with our arms. To go from the typical arms horizontal of a scarecrow, to straight down at our sides. It was just enough movement to catch the eyes of a few passers by. Then, we decided to do shift switches, and when traffic was coming, we would cross (in a timely manner of course) as vehicles were approaching. Then we would resume our pose. This resulted in honks! 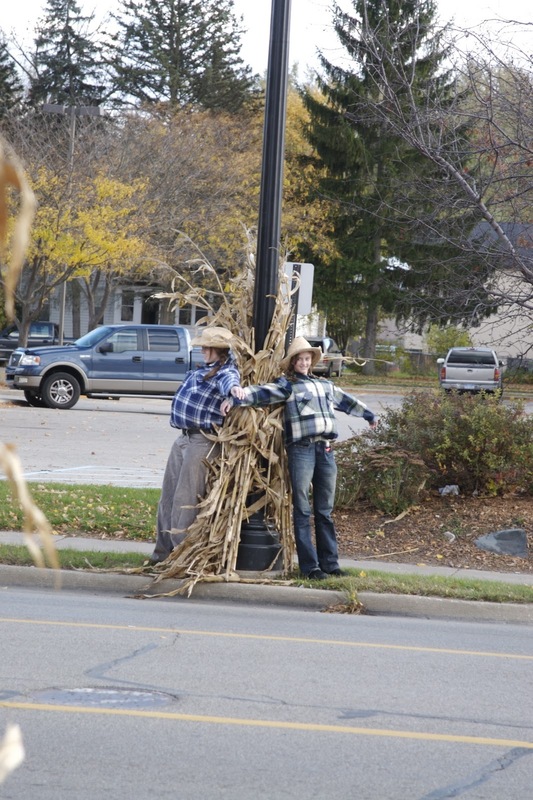 My Mom went to the bank across the street while we were outside and she heard a patron say, "There are two real life scarecrows outside right now!" 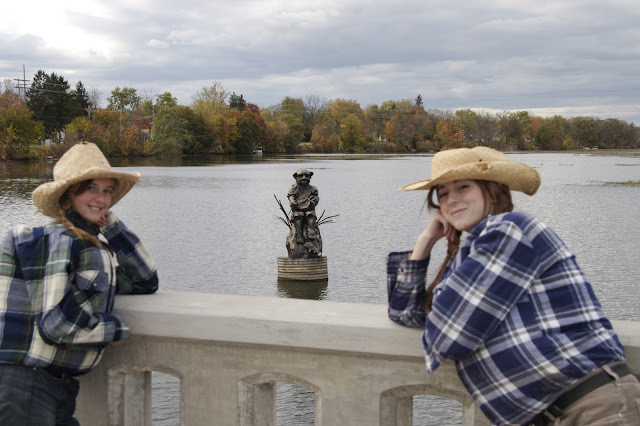 Honestly, it was SO fun and I truly feel that we have redeemed the scarecrows for me. I will no longer loathe them, but appreciate them as the source of a very fun memory with my brother and sister! My brother Brad took the pictures! Initially, he drove by and didn't see us, but stopped at my parents business and noticed us when he got out of the truck :-) I was excited to share the memory with him, too! When we felt satisfied with our efforts on the street, we decided to take a stroll through downtown and take pictures with a few of the other scarecrows. This guy in particular makes the blog because of my good friend Emily. Like Emily, he's a University of Michigan fan! 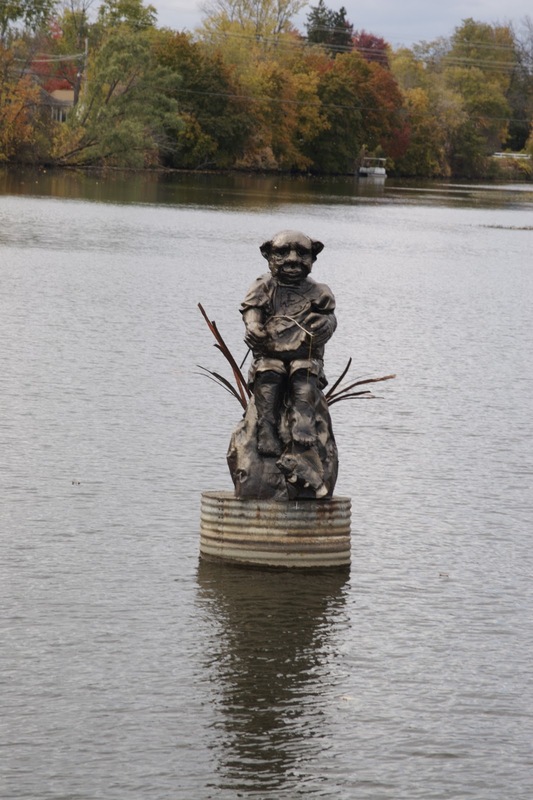 Oh gosh... this is the new troll statue in Lowell. Don't even get me started on this. He's ridiculous. Brad had it right today when he said, "I can't wait 'til someone puts a bra on it" (Brad always has the best ideas!) But Lindsay wanted me to post a picture of him so, here he is, Sis! It was a really fun memory to make with Brad and Katie! Oh gosh did this make my night to see this! A) you guys have guts and are very clever..I would never have though to do this..good old fashion fun. 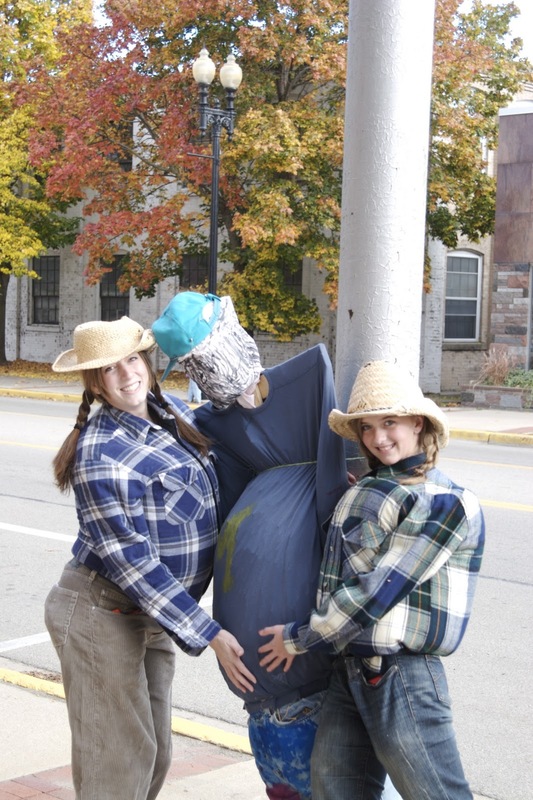 B) Thanks for the shout out..glad even the scarecrows are reppin UM! Thank you for posting a picture of the troll. He is so creepy!!! And I love the scarecrow pictures! What is inside your shirts? A pillow? And they are Greg's shirts I assume? How fun! You seriously have such fun, amazing ideas, friend.